Winter flooding in Midwest reaches major and historic levels. This is what it looks like when a house literally floats away. Flooding continued to devastate Missouri and Illinois on Wednesday, and officials reported it wasn’t expected to abate anytime soon. With banks overflowing, levees overwhelmed, and trucks and buildings submerged, the two Midwestern states are experiencing what the National Weather Service is calling “major to historic river flooding” that should last through early next week. The situation sounds like a scene from an apocalyptic disaster film: At least 20 deaths over the past several days have been blamed on the flooding, and two more people were still missing as of Wednesday. In southern Illinois, a prison that houses 3,700 inmates was at least partially evacuated. A McDonalds is underwater. 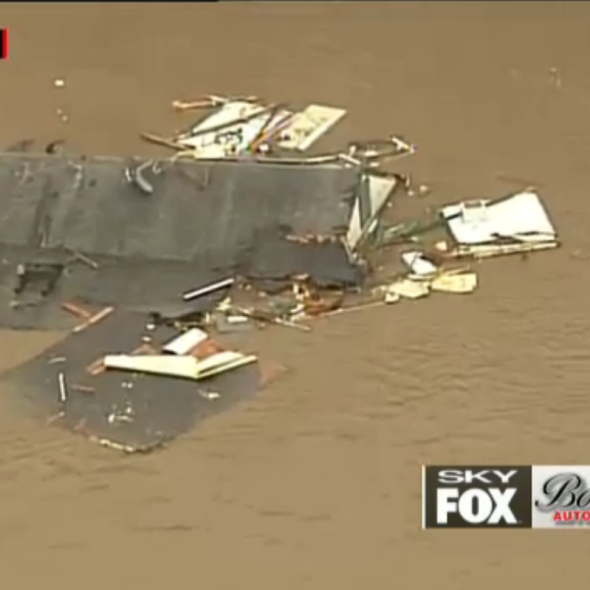 Also, this house could be seen floating down the Meramec River after apparently coming off its foundation. A freaking house! The region is in a state of emergency, and the U.S. Coast Guard and National Guard have been called in to protect people from the rare winter flooding. “We’ve never seen water this high,” Missouri Gov. Jay Nixon told CNN. Hundreds of roads have been closed. Hundreds of homes are in danger. Entire towns, including West Alton, which is about 20 miles north of St. Louis, have been evacuated. And it’s not over yet: “The Mississippi River is expected to reach nearly 15 feet above flood stage on Thursday at St. Louis, which would be the second-worst flood on record, behind only the devastating 1993 flood,” according to the AP. And on Monday, wastewater treatment plants in St. Louis and Springfield failed, leading partially treated sewage to flow into a river in Springfield. Meanwhile, residents of Branson in southwestern Missouri were told to evacuate on Wednesday due to the threat of flooding. Yet the tourist town’s shopping district along the lake remained open. “It has been packed with people,” Fire Chief Ted Martin told the AP. “I don’t know where all of them have come from.” What is happening, America!